You are formally invited to attend this year’s Valentine’s Day Art for Dinner. This Valentine’s Day (Thursday, February 14) at 621 Gallery, the evening kicks-off with an hour long reception starting at 6pm which includes an open bar, hor d’oeuvres, and live music. Each table is a work of art curated by an art professional and host which offers a decorative and enchanting atmosphere. 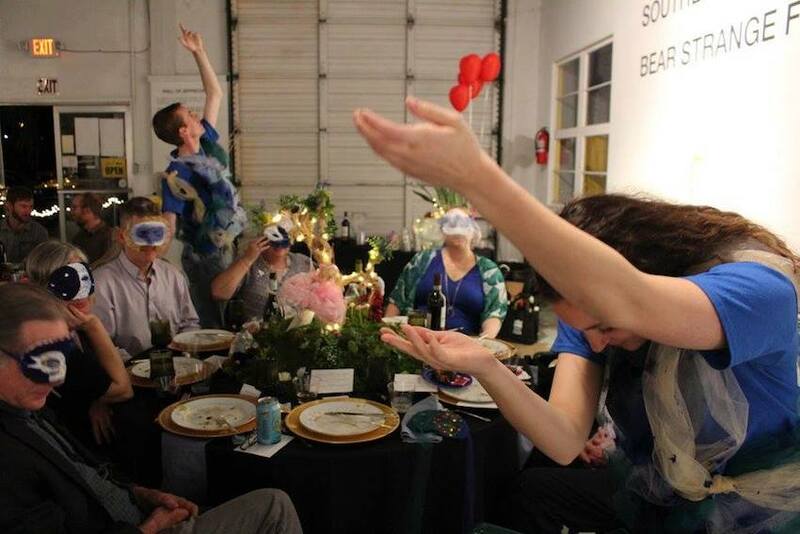 This year’s thematic dining presents ten original interpretations of love; dinner will be served at 7PM. Exciting your taste buds is just the beginning, all tables will have an ART Menu listing the featured performances of the night. This diverse variety of LIVE art performances will entertain guests at their table, creating a genuinely immersive art experience! Catered by Gamescape Cafe, this fine dining experience offers a choice of Stuffed Chicken Breast with Green Beans and Roasted Red Potatoes OR Savory Stuffed Acorn Squash with Green Beans & Roasted Red Potatoes (gluten FREE). Both options are served with dinner rolls & butter. Dessert is Red Velvet Cake. Tickets sold out last year, so purchase your tickets now by clicking the link below! This benefit helps sustain 621 Gallery as a platform for multiple art forms and artists in the Tallahassee area. With your help, 621 Gallery can continue bringing contemporary art and innovative programming to the community.